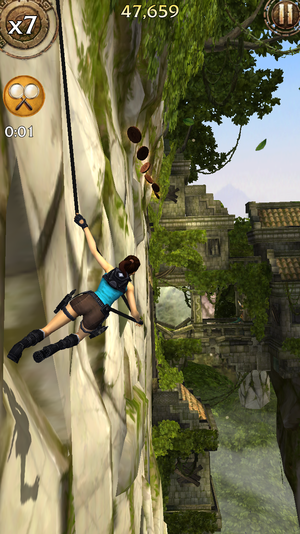 It's much simpler than the console games, but the Tomb Raider star does well in this endless runner. 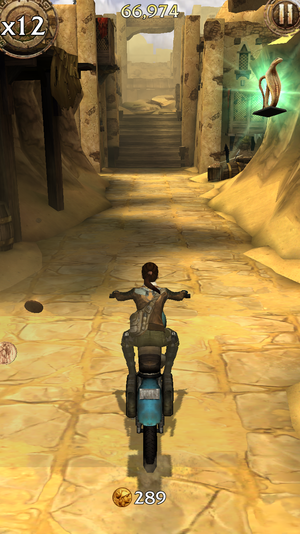 By foot, bike, or ATV, you’ll swipe to change lanes as you avoid obstacles and snag collectibles. The earliest Tomb Raider games have hit the App Store in recent months, offering a cheap blast of nostalgia—and a reality check that 20-year-old 3D action games don’t often hold up well, especially with touch controls. 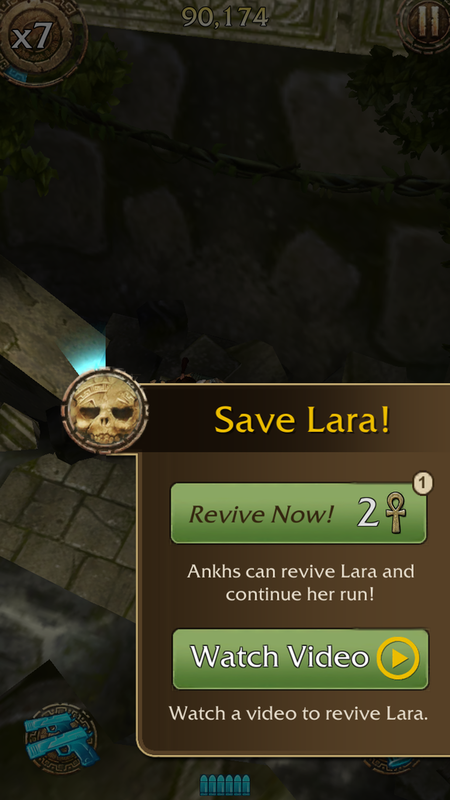 But Lara Croft: Relic Run is luckily something quite different: A game specifically built for touch that puts the franchise heroine in a new adventure better suited for phones and tablets. That’s not to say that Relic Run is particularly innovative. For the most part, it’s a pretty standard behind-the-back, three-lane endless runner, challenging you to swipe to dodge hazards and continue barreling ahead. But it has the trademark cinematic flair of the Tomb Raider franchise, and just as importantly, it offers up a fun experience without aggressive freemium tactics. Despite its flashy looks and death-defying scenarios, Lara Croft: Relic Run isn’t all that daring: This is tried-and-true genre fare, at its core. While thematic comparisons to Temple Run are apt, Relic Run plays more akin to Subway Surfers and games of its ilk. You’ll have three lanes to switch between as you encounter various jungle and desert obstacles, and swiping lets you change lanes, leap, and slide through low openings. It’s pretty familiar, approachable stuff. Wall rappelling is a neat twist: it’s still a three-lane runner, only you’re going up and down and the jumping from the wall to dodge hazards. Luckily, Square Enix didn’t stop with the basics, and it’s the new elements that make Relic Run feel distinctive. For example, you can run along walls in certain spots—still by swiping, but it changes the dynamic a bit. You’ll also ride a speedy ATV or motorcycle for extended stretches of time, as well as rappel along walls as the three-lane approach is rotated 90 degrees upon the side of a mountain. And there’s combat, as well. Every so often during a run, you’ll draw pistols—which can be swapped for a crossbow, shotgun, or other weapon—and hunt down fantasy monsters in shooting gallery-style segments. You’ll even battle the massive T-Rex seen in the early Tomb Raider games, not only shooting it at key moments, but also swiping to dodge its attacks as it tramples around. Relic Run has a lot of those cinematic moments, which take some of the control out of your hands, but it makes for a very polished iOS game. Still, the frequent cut-scenes and busy, winding environments make it tricky to see the hazards ahead of you at times—I certainly died a few times due to not having a clear look at danger on the horizon. Given that, it can be tough to build a rhythm in Relic Run, but the game is pretty generous with its free continues—up to a point. Trying to string together an especially long run may tempt you to spend a little money, and Relic Run is happy to oblige. You’ll want a new outfit for higher scores and special perks, but they’ll cost more gems than you’re likely to pick up via gameplay. Relic Run doesn’t have any freemium barriers that block continual play: There’s no energy meter, and you won’t even see ads pop up without your consent. You can play as often as you’d like without paying, and that’s great. 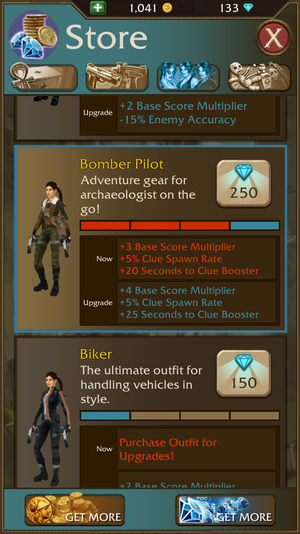 But as with many other free-to-play genre entries, Relic Run offers opportunities to spend big to enhance Croft’s abilities and arsenal. Coins and gems are the two currency types found in Relic Run, with coins found constantly throughout the stages and gems rarely appearing at all. It’s no surprise, then, that the best of the upgrades can only be purchased with the latter, which can be bought in large bundles ranging from $1 (100 gems) to $50 (12,000 gems). Coins are also sold in similarly priced bundles—1,000 coins for $1 to 120,000 for $50—but you’ll snag a fair amount of them simply by playing the game. That’s a lot of money to spend on improved power-ups! 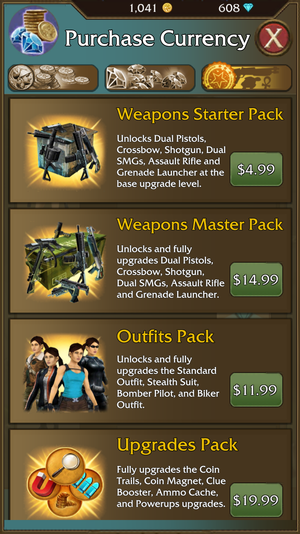 Relic Run isn’t pushy with in-app purchases, but they are available. Lara’s advanced outfits—which offer a higher score multiplier and have other small perks during gameplay (like making enemies weaker)—are the most tempting gems-only purchases in the store. And if you want to set the highest scores, you’ll want to grab at least one of those outfits. However, if you wish not to bother with currency conversions, the store also sells content bundles for straight cash. You can get all four fully upgraded outfits for $12, all weapons unlocked and upgraded for $15, and all upgraded power-ups for $20. That’s a lot of money to spend on perks in an iPhone game, especially when the superb recent Tomb Raider reboot for Mac is just $16 on the Mac App Store—an absolute steal for a game of that scale and quality. By comparison, Lara Croft: Relic Run delivers quick bursts of polished fun, but I wouldn’t invest heavily in it. The supply drops help you snag continues, but if you run out, you can watch a video ad instead of spending money on gems. However, Relic Run’s free supply drop—which is available every six hours—delivers a free injection of continues, gems, or coins, plus you’ll sometimes have the option to watch a video ad in exchange for a continue after a run ends. That’s all pretty generous, and the game is otherwise very hands-off with its monetization attempts. You can spend money, of course, but you don’t have to. In other words, it’s a pretty ideal freemium game. 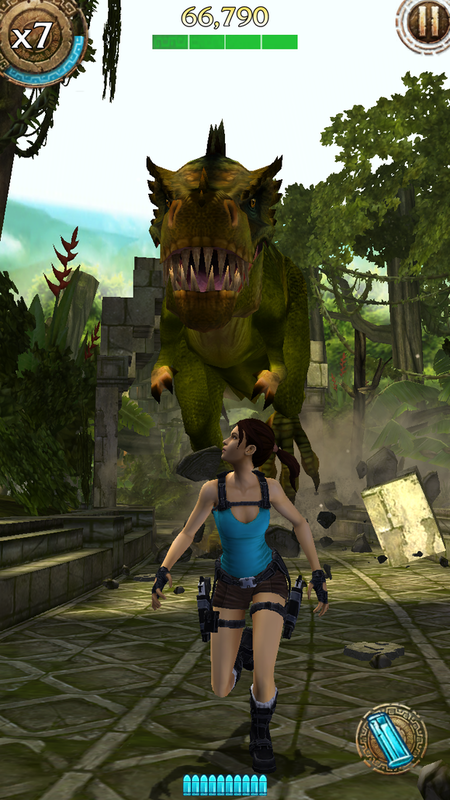 It’s the classic Tomb Raider T-Rex! Relic Run’s cinematic moments are attractive, albeit occasionally distracting. 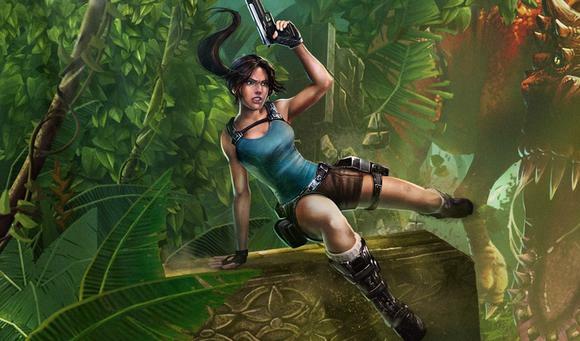 Lara Croft: Relic Run adds a nice cinematic touch to the endless runner genre, delivering strong production value while injecting some welcome variety into the mix. The elements don’t always gel perfectly—the quick camera cuts can kill your flow, or make it difficult to spot the next hazard ahead—but at least it feels like a well-considered blend of endless running with the classic Tomb Raider spirit. A few smart tweaks could go a long way toward making it a truly great runner. And it’s a really enjoyable game that doesn’t pressure you to spend money, although you might be tempted to hit up the store if you’re trying to top friends’ high scores. Granted, the ability to spend money on advantages does dull the competitive edge, but that’s true with all free-to-play games. If you can enjoy Relic Run for what it is—a slick freebie and very solid mobile spinoff—there’s plenty of fun to be had.